It's no secret I love celebrating birthdays. Birthdays in our family usually are celebrated a few times, at least! We always make a Shabbat birthday celebration around whoever's birthday it is. 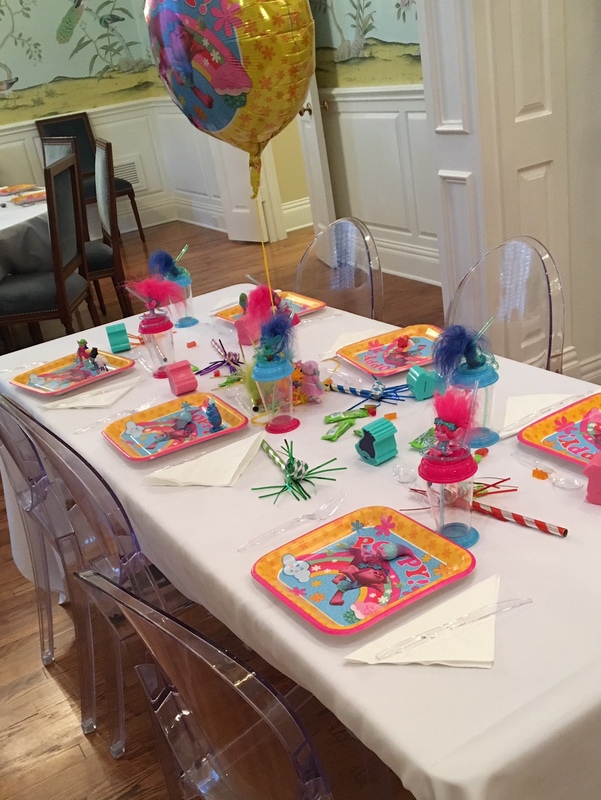 Well, this week it was Liam's 5th birthday shabbat dinner, and I really wanted to make it extra sprecial. He loves trolls, so we went to town with troll decor. After seeing a video on Cinnamon Roll Challah, I had to try it. The results were phenomenal, you must make this. I kept the meal simple, he had requested spaghetti, and he loves caesar salad. Place the challah dough ingredients into bread machine bowl with paddle attached in the order listed above. Make a small well in the flour and add the yeast. Put machine on dough cycle. When the dough cycle is over, my machine is 90 minutes, remove the dough. Evenly spread the cinnamon filling over all of the rectangles. Roll each rectangle up longwise, to create a rope, pinch and seal the seam. Take 3 of the pieces and braid. Place the to challahs on the prepared sheet pan. Cover with a dish towel and let rise for 30 minutes. Place in the oven. I did not use an egg wash, but if you are making regular challah you need to crack an egg into a bowl, beat it, and brush it over the top of the challahs before putting in the oven. Brown the ground beef in a large pot with the oil, garlic, and onion. When the meat is completely browned add the rest of the ingredients. Stir thoroughly to combine. Let mixture bubble and then turn heat to low and cook for at least an hour on low. Can't wait to hear how y'all like these recipes!